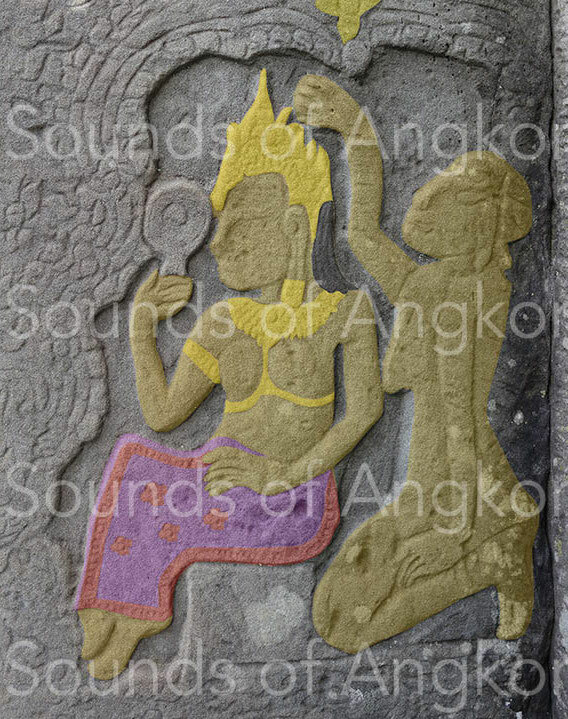 DANCERS' HALLS OF BAYON ERA - Site de soundsofangkor ! 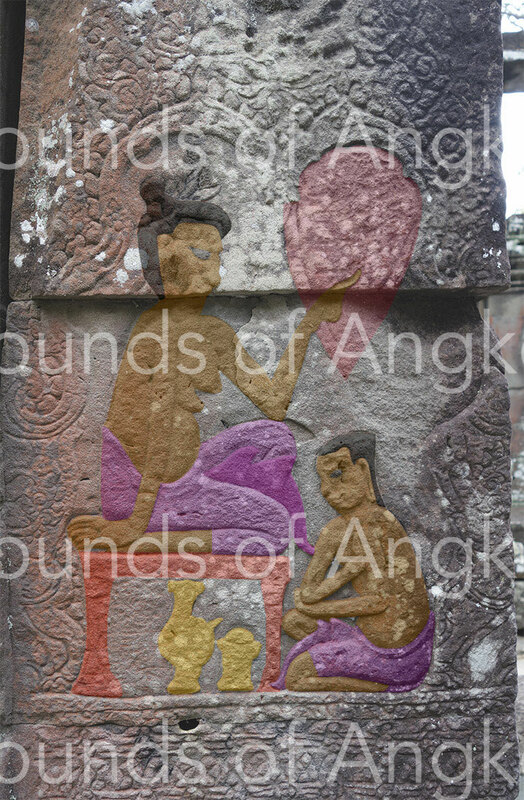 We will examine, through this article, the nature, the function and the decorations of the so-called ‘dancer’s halls’ of two great religious buildings built by the Royal Triad: Preah Khan of Angkor and Banteay Kdei, to whom we will add the Bayon while comparing them to the dancers' gallery of Angkor Wat. We are here overlooking the Ta Prohm one, whose dancer’s hall is inaccessible for several years because of restoration work and Banteay Chmar in ruins. These halls are so called because of the many representations of female dancers. Several studies don’t conclude as to their final destination. 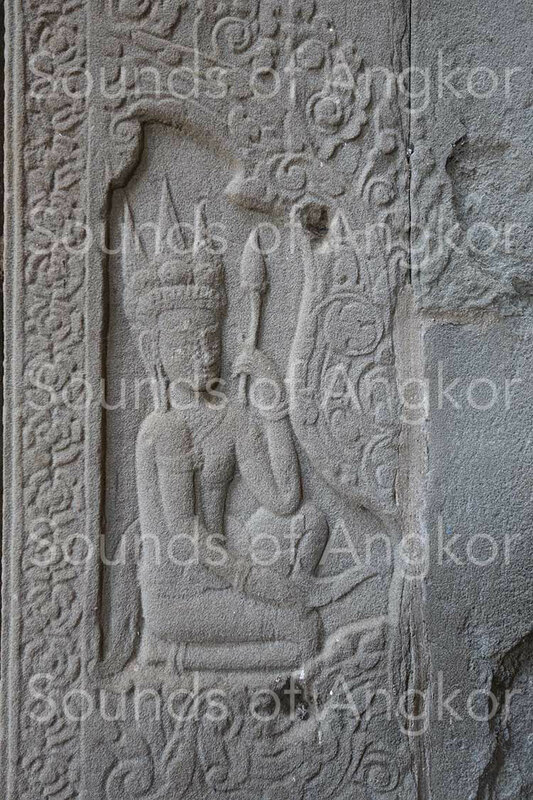 Olivier Cunin, in DE TA PROHM AU BAYON - Analyse comparative de l’histoire architecturale des principaux monuments du style du Bayon (Volume 1 - p.56) writes: (our translation) "The function of these "dancer’s halls" remains still today an enigma. The friezes of apsaras or dancers adorning the interior of this type of building are the origin of their current name. This denomination, convenient to designate them, was with time assimilated to their original function. Nowadays, commonly associated with the execution of ritual dances that were to be performed by the dancers' corps associated with the large complexes with such a building. 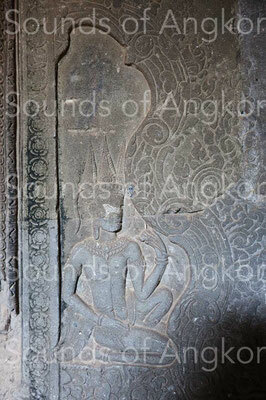 Ta Prohm, Preah Khan of Angkor, Banteay Kdei and Banteay Chmar are the only complexes of Jayavarman VII with such a dancers' hall." We will rise here an error of interpretation concerning the termination "friezes of apsaras" which, in our opinion, does not correspond to the reality. 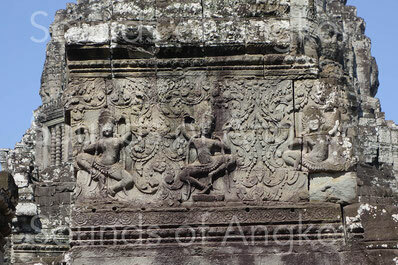 See our article: Apsaras or sacred dancers?. 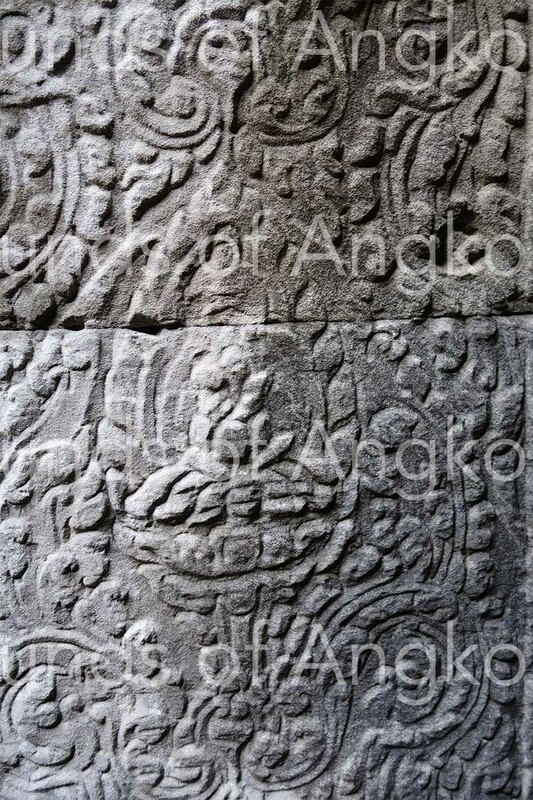 Moreover, if the Bayon doesn’t have a dancers' hall built on the model of the four temples cited by Olivier Cunin, it has spaces with similar characteristics in terms of architecture (halls with columns located outside the main sanctuary) than iconography (dancers engraved on the inner pillars and dance masters on the pilasters of the entrances). Today, new clues are shedding new light on the so-called ‘enigmatic’ function, or more precisely unconfirmed, of these dancers' halls. 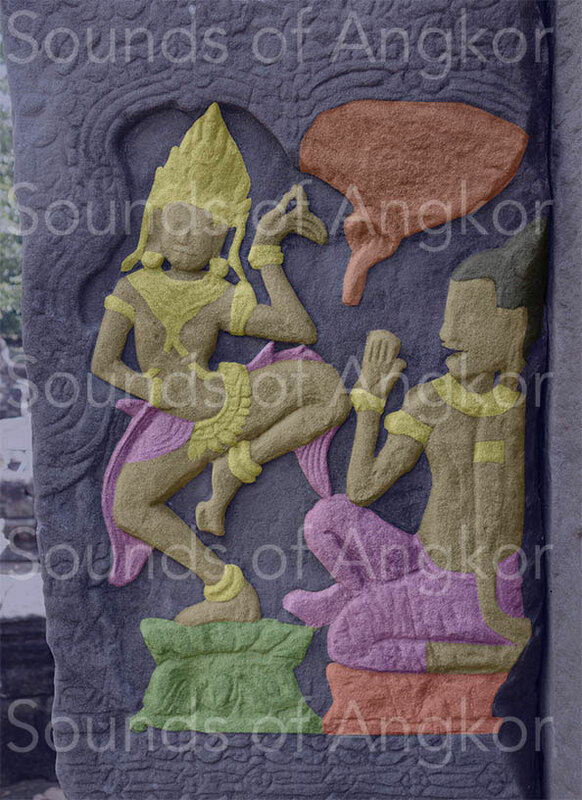 The dancers’ halls of the three temples mentioned above, and more broadly in Bayon, the pillars of the outer gallery and the axial pavilions, show depictions of dancers. 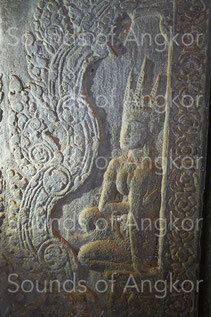 But pillars and pilasters, in Banteay Kdei and Bayon, also show characters that we will call "female dance masters" here. We will briefly describe the locations where all these characters are depicted. 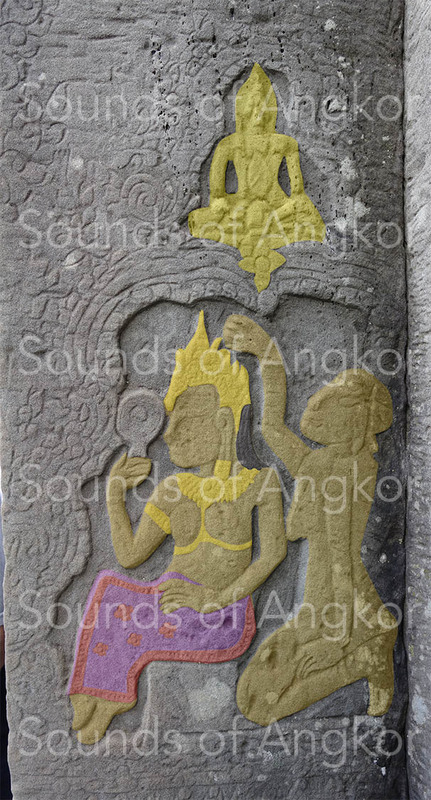 In Bayon, large-scale dancers are depicted in high relief on the pediments of the doors opening onto the inner courtyard. On the pillars of the axial pavilions located at the four main orients and the four intermediate ones, dancers are represented alone, by two in mirror or by three (a large figure in the upper register and two smaller ones in the lower register, in mirror). The outer gallery of Bayon is lined with two rows of pillars. 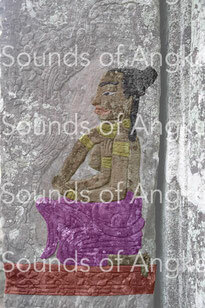 Most of the four faces of the inner row are decorated with a female dancer. As for the pilasters of the fore-bodies of these pavilions, they are engraved with images of dancing masters, more rarely dancers preparing themselves and, in two cases, a harpist. 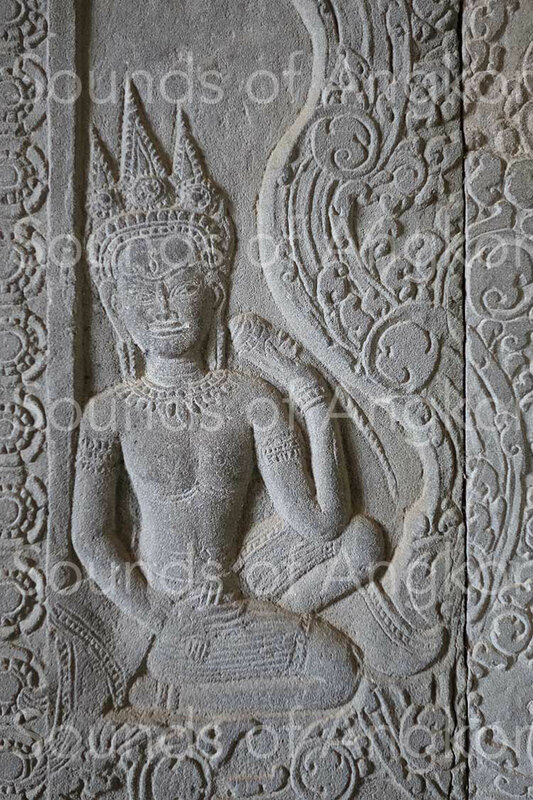 In Preah Khan, on the interior pediments of the dancers' hall, friezes in high relief represent dancers in symmetry on both sides of a larger central dancer. 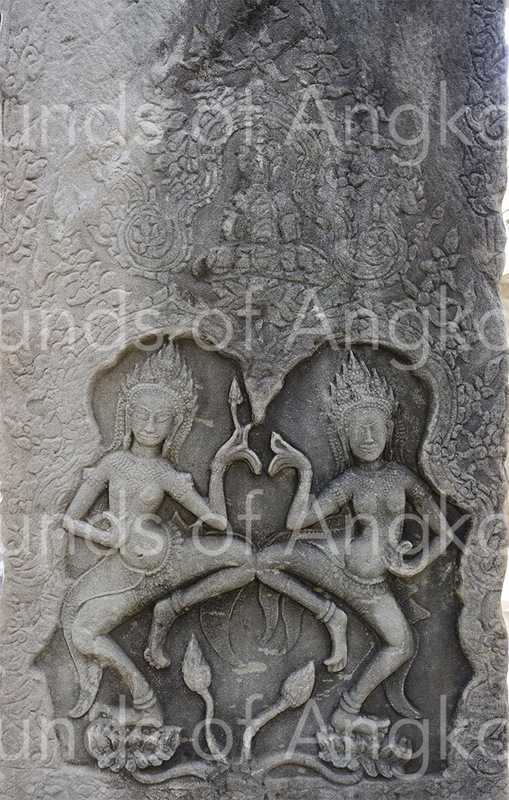 Most of the pillars are engraved with two dancers. 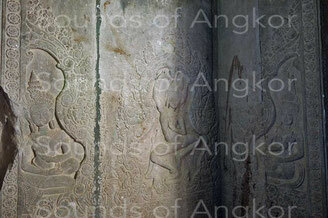 In Banteay Kdei, the pillars of the dancers' hall are engraved with duets of dancers. In Bayon and Banteay Kdei, the pilasters of the forequarters of the axial pavilions are engraved, inside and / or outside, with scenes showing dance masters and, more rarely, female musicians. We will develop further the detailed typologies of these scenes. Fronton with sacred dancers. Bayon. 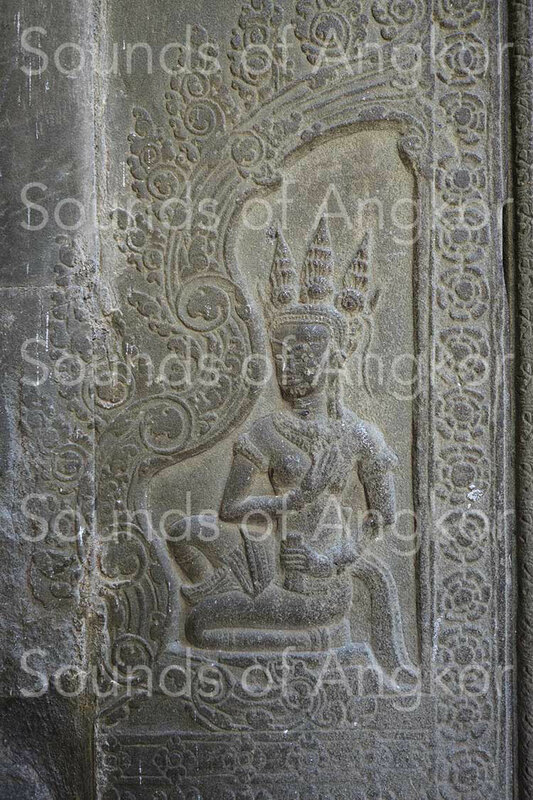 The dancers’ halls of the three temples mentioned above, and more broadly in Bayon, the pillars of the outer gallery and the axial pavilions, show depictions of dancers. 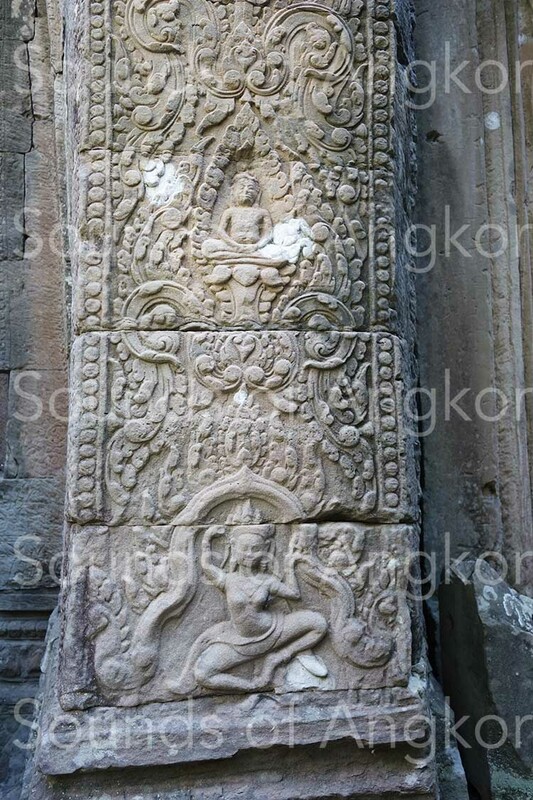 But pillars and pilasters, in Banteay Kdei and Bayon, also show characters that we will call here ‘female dance masters’ here. We will briefly describe the locations where all these characters are depicted. LXVII ... In total 79,365 with the Burmese, the Chams, etc. 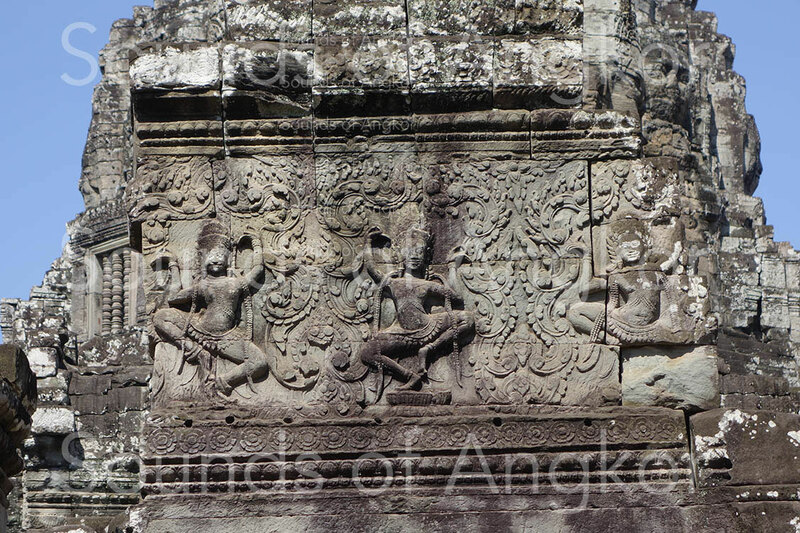 The dancers proper, represented according to the temples and the locations, alone, by two in mirror, by three, or in long friezes (Preah Khan of Angkor). One can also see these same dancers get ready to go dancing, pay tribute to their dance master or receive advice from them. Dance masters, with or without their student, represented as mature women recognizable by their bun and hanging breasts. Sometimes, the sculptor has deliberately realized these characters, rather benevolent or severe. Apart from these two types of characters, there is in Bayon, quite exceptionally, a single harpist and a singer accompanied by a harpist, corroborating the nature of string orchestras developed on wider bas-reliefs at the Bayon and Banteay Chhmar in other contexts (court music and festivities). Dance master and her student. 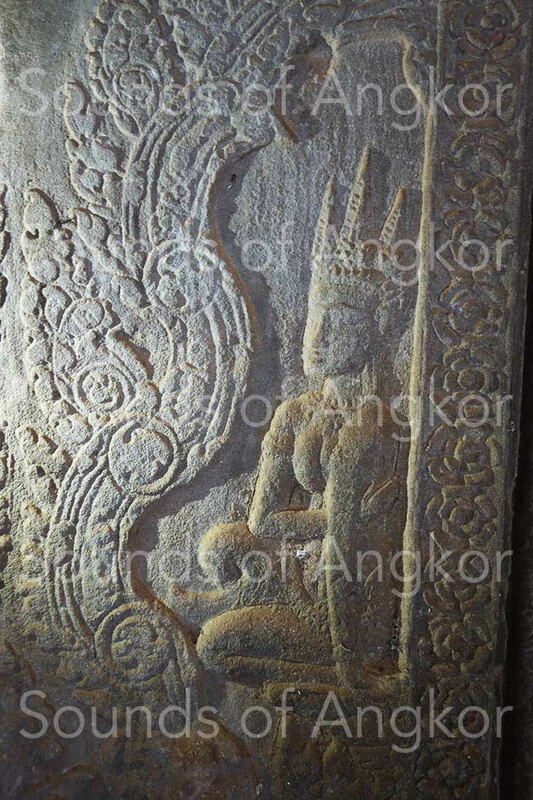 Banteay Kdei. Frize of dancers. 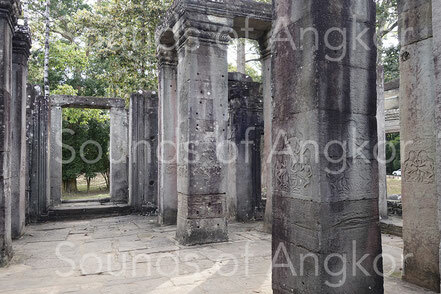 Preah Khan. We have just mentioned the existence of scenes representing dancers (or novices) paying tribute or listening to a female dance master. The training of the dancers and the rehearsals were to be an important part of the ballet corps’ schedule. Today, it takes about ten years to teach an accomplished dancer in the royal ballet of Cambodia. 3. Buddhas have been transformed into floral decorations. Some of them, however, have been forgotten in the destructive madness and have survived intact. They are usually located in less visible or less well-lit areas. They would have escaped the vigilance of the foremen responsible for the verification of the work of borage. Unless workers who disagree with the Brahman hierarchy have disobeyed by failing to burn them. One could also think that when the general form remains visible, the destroyer had the same intellectual step. But this remains an enigma. The Hindu temple is built like the image of a perfectly ordered universe. When the devotee enters, he actually walks an initiatory path inside his own body, while traveling symbolically through the solar system. In the temple, a function of first order is attributed to the planets of our solar system, which numbered nine at that time: Sun, Moon, Mercury, Venus, Mars, Jupiter, Saturn and the two lunar nodes as Rahu (head of the dragon) and Ketu (dragon's tail). In the Khmer temple, the planets are represented by nine deities (Navagraha). 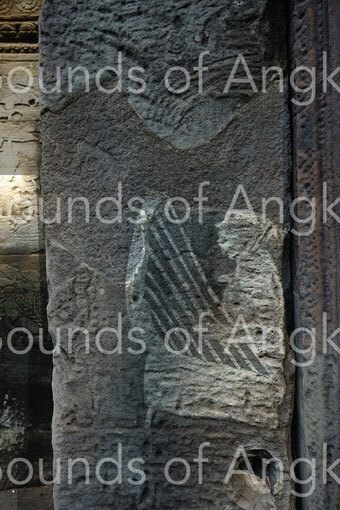 Those of Bayon are still in situ within the carved stones piles in the West court, near the entrance. 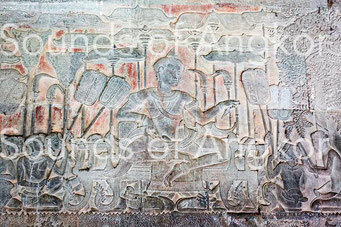 The nine planets in Bayon. What was the nature of ritual dances in the temples? Katia Légeret, researcher specialized in classical dances of India, enlighten us as to the vocation of the dancers of ancient India: "For millennia, the myth of the Creation was transmitted orally in the form of a symbolic gesture which combines dance, music and poetry, in other words a "total theater". The temple dancers regularly performed the ritual of the nine planets. The Nâtya-Shâstra, the oldest treatise devoted to dramatic art, does not envisage the construction of a scene or a public performance without a prior invocation of the planets. Even today, the dancers of Bharata-Nātyam for example, at the beginning of each show, at the time of the offering of flowers (pushpanjali), invoke the planets and divinities of the cardinal points, soliciting their benevolence." This ceremony is reminiscent of ceremonies for ancestors and masters celebrated before any "artistic" performance of a ritual or performative nature. Let us now return to images other than those of practicing dancers, carved on the pillars of the dancers' halls and the Bayon's axial pavilions. Let's take a look at some of them. Several images show us dancers looking at each other in a mirror. Here, the dancer prepares alone. Her bracelets and harness are not visible. In front of her, a box containing perhaps her jewels. 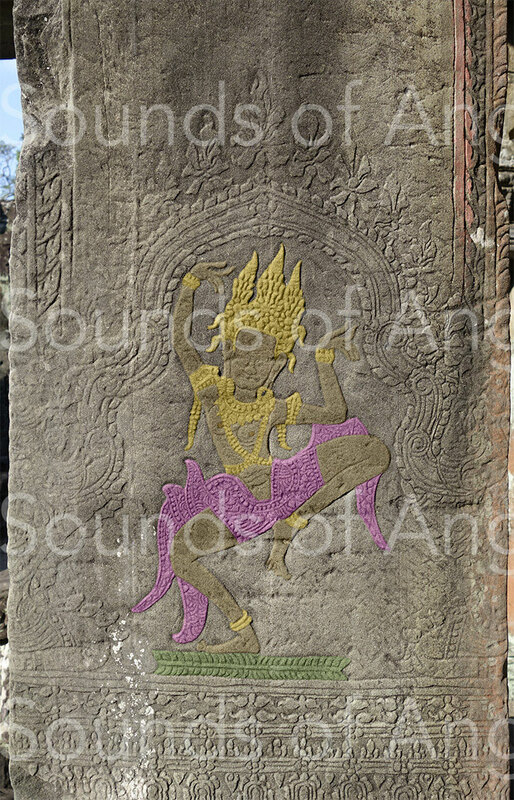 An engraving of Bayon shows us a dancer preparing to dance. The image is of poor quality but most of the information is present. The dancer is sitting like in Occident. She wears the standard jewels of temple dancers (crown, necklace, shoulder belt, bracelets, ear pendant). She looks at herself in a mirror. She is dressed by a mature woman recognizable by her hanging breasts. Her garment is bordered and decorated with four-petal flowers (pka chan). On other images, we discover dancers paying tribute to their dance master or receiving advice. This practice is still alive in contemporary Cambodia. The ritual utensils, including a ewer and a pot whose destination is unknown, are clearly visible under the seat of the dance master. 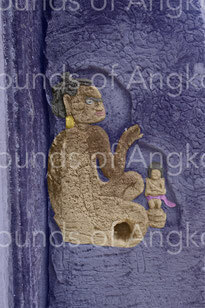 In this image, the engraver brings us several information. The presence of the curtain reveals the intimacy of the place. The character sitting on the stool is a mature dancer. She is wears a traditional bun. Her belly is bounced and her breasts slightly drooping. Her garment shows two folds in a triangle, typical of those of the dancers. Her right arm curved outward is undeniably that of a dancer. Although many Khmer women have this anatomical feature, the work of extending the arm at the elbow is one of the exercises that dancers must undergo during their training. 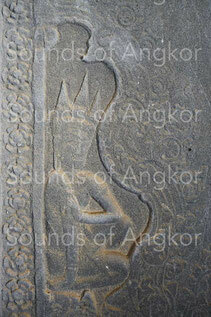 It is part of the aesthetics of Khmer dance until today. Her tense finger indicates she is speaking; here she is probably giving advice. The student sits on the floor as a sign of submission to authority, feeling accentuated by the arched back. Her two arms are folded as a sign of listening (canonical representation). Her short hair says she is single. At the foot of the stool, a ewer that is used by the dance teacher to symbolically purify her pupil. This character is unusual. He seems to be very fleshy. Indeed, between her chin and what we suppose to be two necklaces, the skin of the neck forms a bead, her breast is big. Her hair seems braided with her thick eyebrow. The sculptor represented the pupil of the eye, which is unusual in this kind of sculpture. The decor of the bracelets is also unusual. (Given the degradation of the sculpture, we don't guarantee the accuracy of the clipping). This dance master gives advice to a dancer in action. Her hand is up but her index is not pointed. This case is unusual since verbal or sung communication is always accompanied by a pointing index. On the other hand, her mouth is open. This image presents the same general ingredients as the previous one but the position of the master differs. She doesn’t openly offer advice. It seems to be a verbal exchange. The student's hand is in contact with the master's knee, reinforcing the intimate nature of the exchange. Also differ objects at the foot of the stool. It could be here a kit to prepare betel quid. In this picture, the dance master listens to her pupil sitting in front of her. She has her arms folded in respect, but her back is straight. Note the floral decor of the curtain and the making of the bun. The sculptor used continuous lines to signify the hair and the decor of the garment reminiscent of unfinished work but ultimately very aesthetic. At the foot of the stool, an ewer and a box. The body positions of the dance masters are diverse. Some clearly portray their role towards the sacred dancers. There is a great heterogeneity in the quality of engraving but the attitudes and the message they carry are perfectly identifiable. • A dancing mistress, who seems to have a strong character, wears a bamboo or rattan stick to correct the students.! 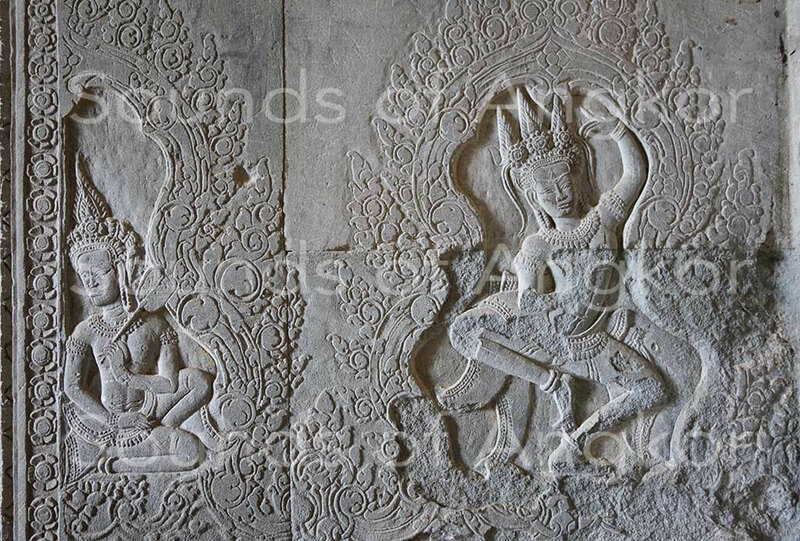 • Persistence of dance masters both at the Royal Palace and Bayon style temples. 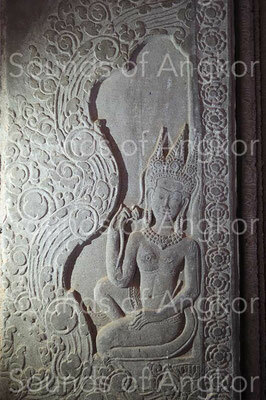 In the 9th century, in the hierarchical administrative texts of the Roluos group sanctuaries, a female inspector (taṃrvac) appears at the head of the list, who seems to be a general supervisor of the dancers, singers and musicians. • Presence of string orchestras with a hierarchy that seems unchanged. 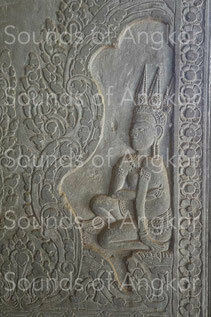 Female characters at the Banteay Kdei dancers' hall could be dance inspectors. The image of one of them, South side, is particularly neat. His bun is adorned with decorative accessories of indefinable nature. This woman seems to differentiate herself from everyone else by her elegance. 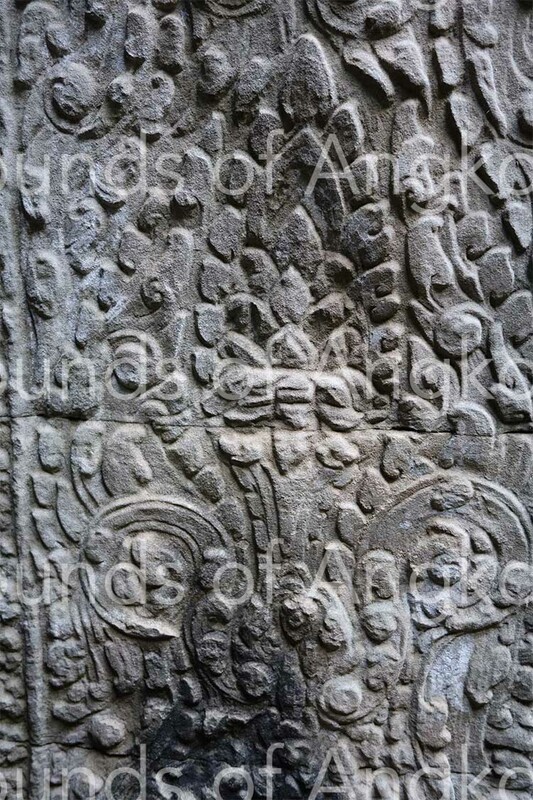 Through the presence of this particular iconography, we can see the control of the comings and goings of the actors as dancers, singers ans musicians inside the ritual space. To this day, dance and music masters are respected by their followers according to strict codes that are reflected in these images. 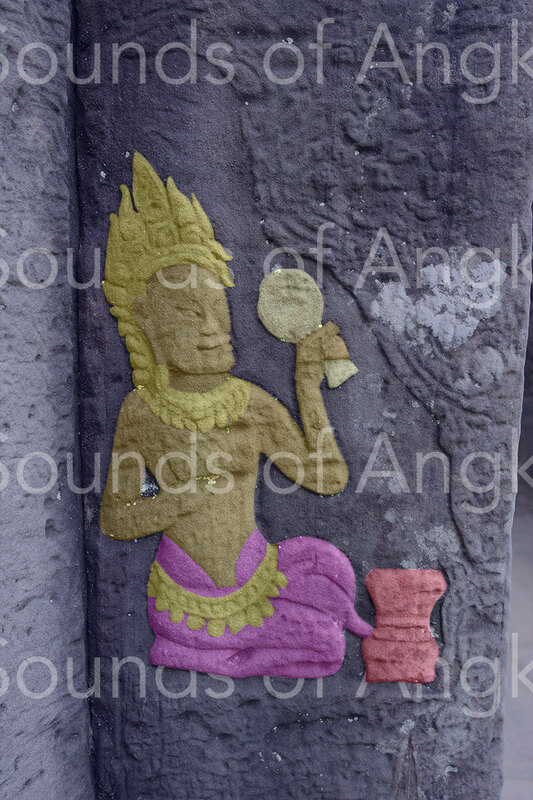 Note that in the Angkorian era, the image has a spiritual or magical force. It's not less so today. Do not devotees prostrate themselves before the two or three dimensional images of the Buddha, of various divinities, or of kingship? The presence, at the four directions, of inspectors and / or dance masters is therefore not innocent. It is then appropriate to consider this index as a presumption of proof that these vast halls were intended for offerings rituals of which dance, songs and music constituted an essential, even indispensable component. 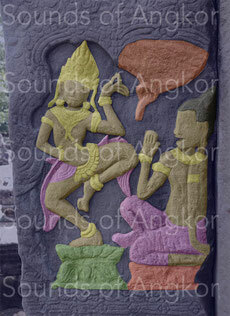 King Suryavarman II in majesty. Southern Gallery. Angkor Wat. 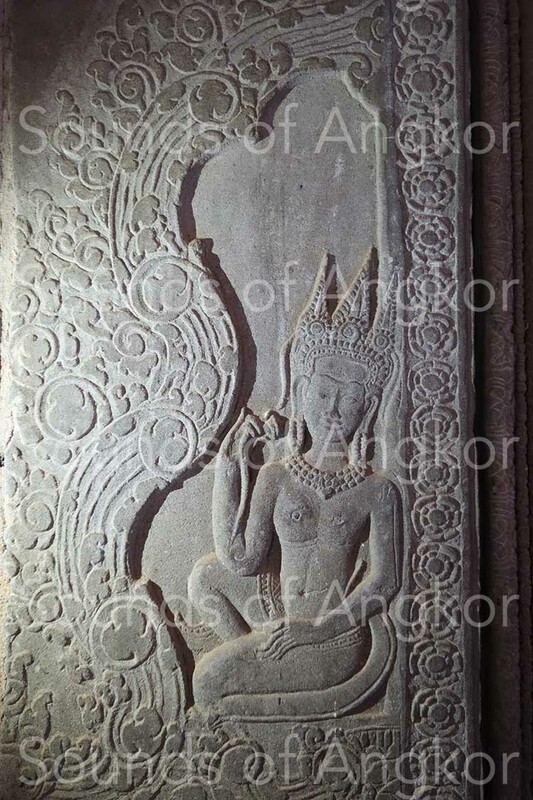 In Angkor Wat, the ‘dancers gallery’ located West just past the moat, is rich with young female characters, sitting, seeming to control the West and East entrances and exits, and the passages between the various interior sections of the gallery. 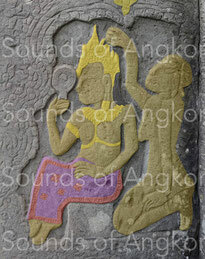 What differentiates Bayon dance masters from those of Angkor Wat is their apparent youth. 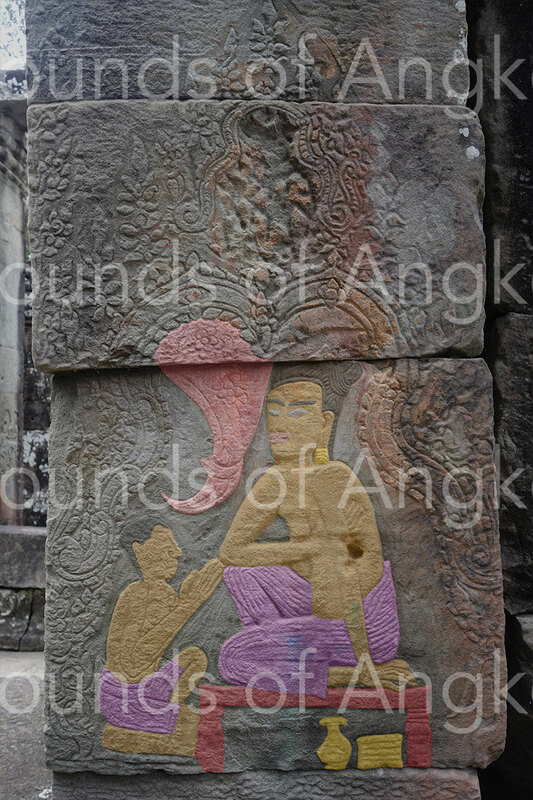 Indeed, their breasts are firm and not pendent as in the Jayavarman VII's temples. 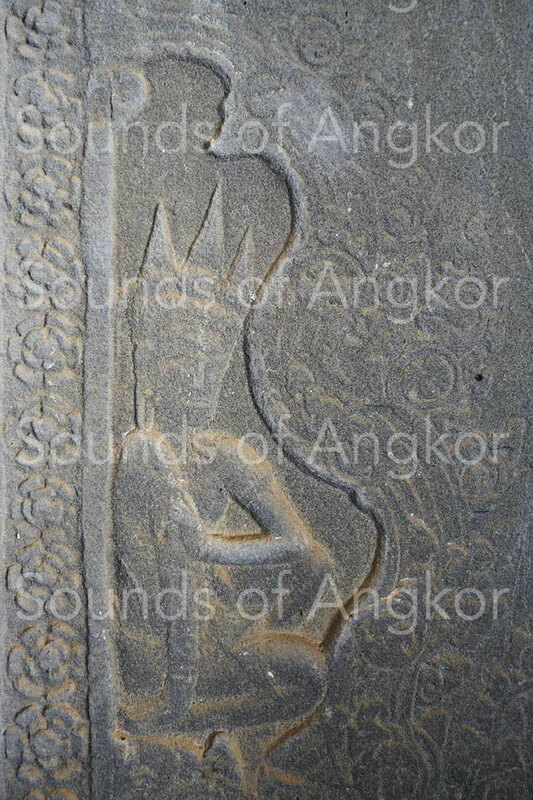 If we examine the attributes of some of Angkor Wat's dance masters, we find that some of them bear the symbol of power that King Suryavarman II holds on the image where he is represented in majesty in the South gallery. Princes, princesses and some devatas, perhaps of royal blood, wear this same emblem. The epigraphic texts teach us that dance and music were among the virtues of well-educated people. So it's conceivable that the control of the good education of the dance was entrusted at that time to women of royal blood. Moreover, if we compare the representation of these dance masters (with probably some inspectors), let us say provisionally, of royal blood, with the representation of the characters of the bas-reliefs of paradise and the underworld (Southern gallery), we see that the body of women who go to heaven has not aged, while those who go to hell have their breasts hanging. 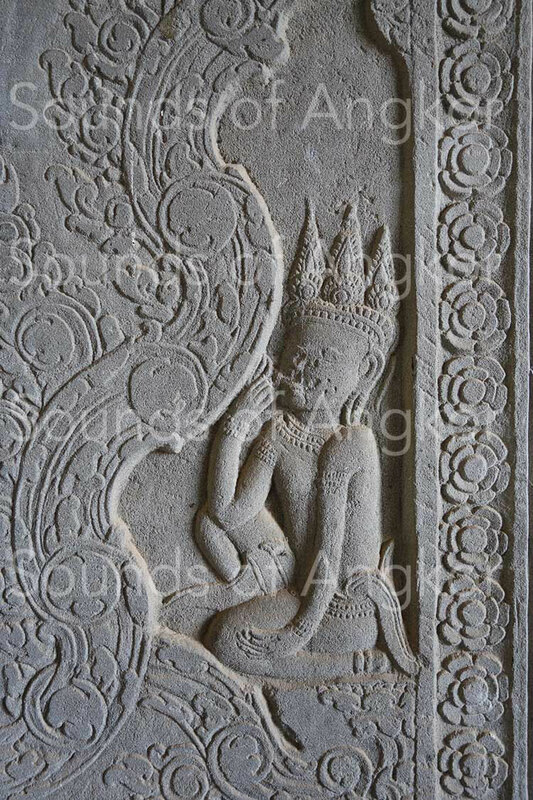 This portrayal of bodily youth in spite of advanced age could be the key to understanding the apparent youthfulness of Angkor Wat's dance masters. The dance masters of Angkor Wat, if any, are not represented in front of their static student but in front of the dancers in action. None are represented with exterior accessories such as an ewer or box. None is expressed verbally (stretched index not shown). Either they are in listening position, or they hold a lotus flower bud or something else. But it could also be a panel of diverse characters: students, dancers at rest, dance masters or inspectors. In this picture 01 we can discern a difference of status between the two characters. The one on the left is represented above, her hairstyle and her clothes seem richer. 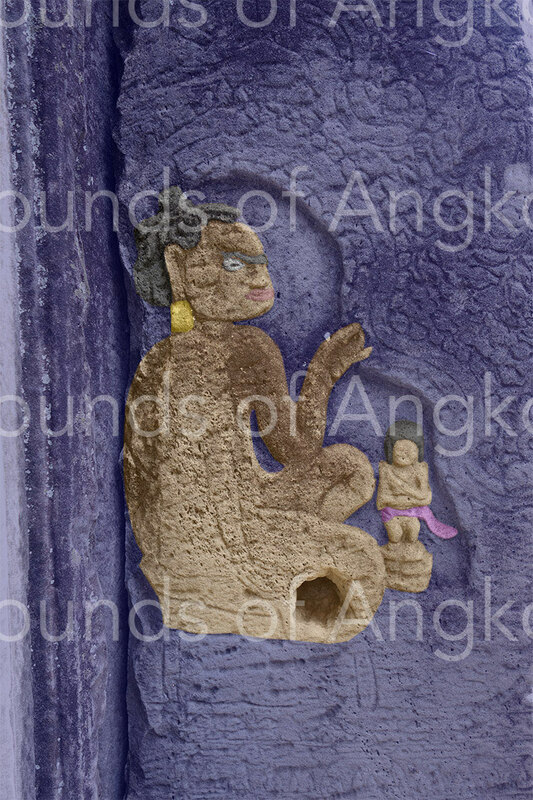 On the picture 02 the character holds an object similar to that of King Suryavarman II. It could therefore be an emblem of power; the character would then be someone from the court. On the picture 03, the character holds some indefinable in her left hand. The character in the 04 image holds a fan. The character of the picture 05 holds a lotus flower bud. The character 06 looks juvenile. She is small. She holds something indefinable in his right hand near her mouth. Her right elbow is also very low compared to her knee, of which not a character of power. The characters of the pictures 07 to 09 have the arched arm. But it is advisable to compare the hairstyles with those of the dancers. Sometimes some of them seem less rich. 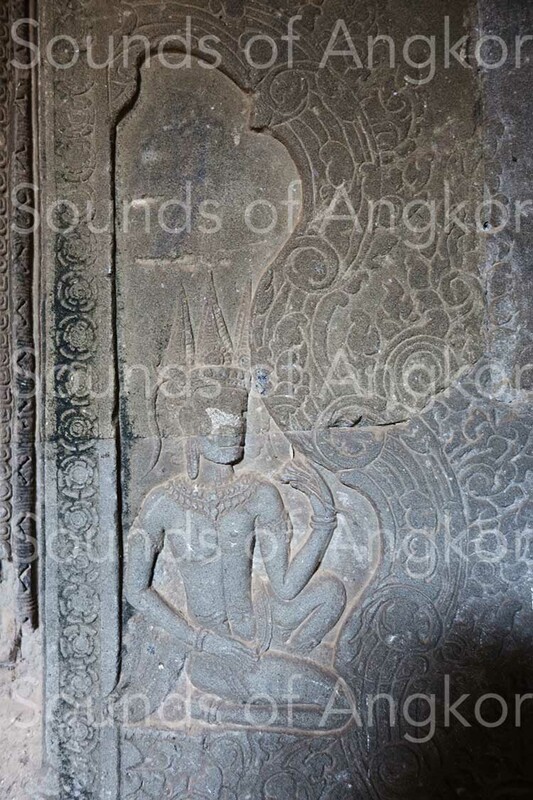 In all four great temples of the Bayon era (Preah Khan of Angkor, Ta Prohm, Banteay Kdei and Banteay Chmar) the dancers' halls are located upstream of the central sanctuary, entering from the East. They could certainly be bypassed. 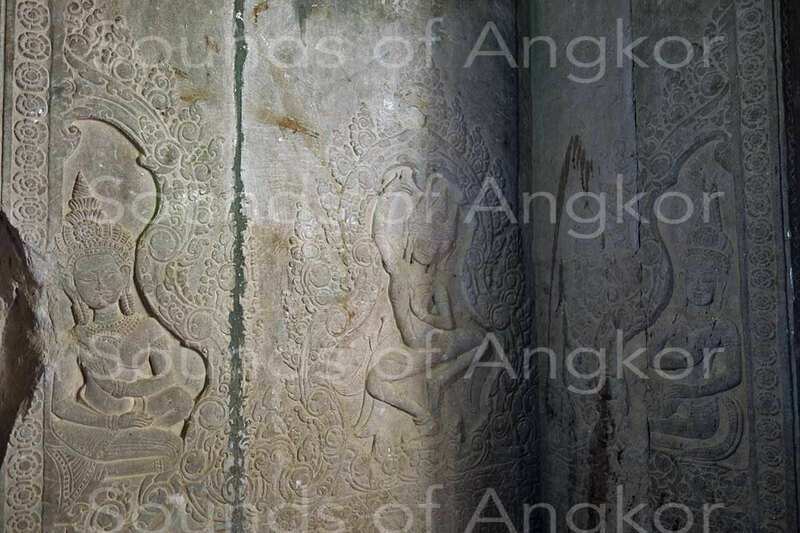 In Angkor Wat, the Dancers' Gallery is the first space to cross from the West (this temple is normally oriented as well). In any case, the location of the dancers' halls seems to tell us that there were rituals of offerings in which dance had a preponderant place. This might indicate that ordinary people didn’t have access to the rest of the temple and had to make offerings in or near these places. The presence of the great Vishnu of Angkor Wat could be a presumption of proof. 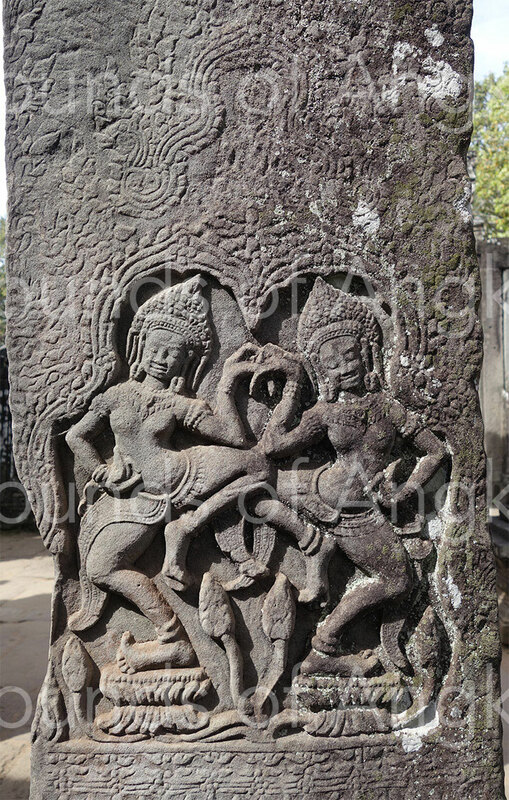 The qualitative diversity of the dance masters' sculptures raises questions both in Bayon and in Banteay Kdei. The sensation that emerges is that of a sculpture laboratory where novice sculptors would have been trained. 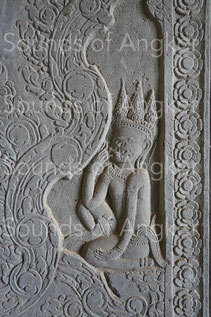 On the other hand, in Angkor Wat, the sculpture is very neat, like that of the dancers. 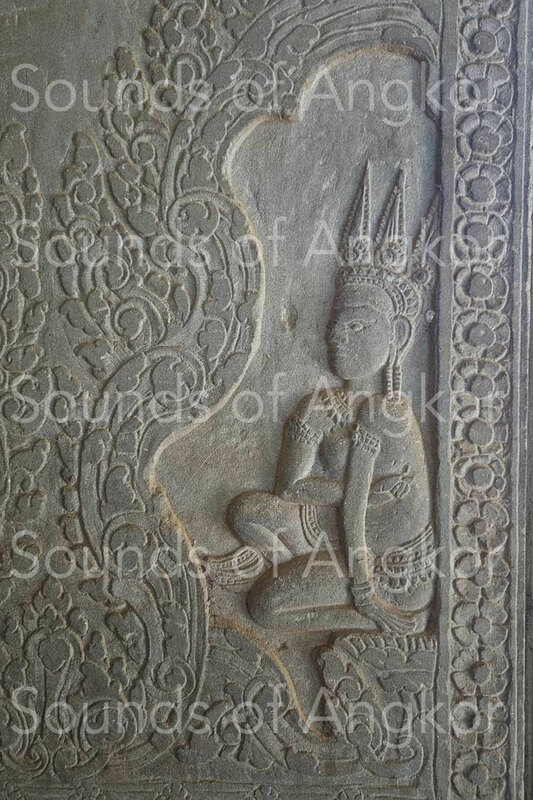 On the walls and pillars of the main Angkorian temples lie hundreds of dancers represented in positions quite different from those of the Apsaras proper. The largest number of performances is located into the dancers’ halls and, in Bayon and Angkor Vat, in the external galleries. The position of the dancers corresponds to a constant canon in the 12th and 13th century. One foot is placed on the ground, another raised, legs bent, two arms up or an arm up and one down. This is not only a canon of representation, but a basic position of religious narrative dances. By ‘narrative dance’ we mean a choreographic corpus that can replace the words and syntax of a text to describe a situation or tell a story. Religious dance is, like the verb, a tool of communication with the deities. Words replace gestures of hands (mudras / seal) and a set of bodily positions. In the South Indian tradition, the mudras reinforce the sacred word (mantra) or mental intention (bhavana) when it exists. One can be surprised by the longevity of the dancers’ existence in Hindu temples. What were the motivations of such a craze? If dancing was offered as entertainment for the gods, what was the benefit to the devotees? If the argument of the religious approach is insufficient, then the answer is plural. It exists a universal component of humanity that is beauty. It attracts and unites humanity. Art exists in all latitudes. 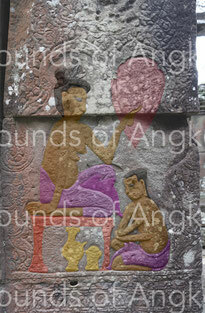 Its first tangible traces date back to the Upper Paleolithic with rock paintings. At that time, music and dance were already existing concepts. Although dance is offered to divinities, the plastic of moving bodies and adornments have always been a source of wonder for ‘spectators’ and a social performance (sometimes competitive) for performers. It was, and still is, an entertainment of choice. In temples, for men (and to a lesser extent for women, depending on sexual orientation), the body of the dancers was a source of fantasy and desire. A fantasy and a desire that inevitably led to the overtaking of the white line and the prohibition of devadasi in Hindu temples by the prudish English settlers in the middle of the 19th century. The best proof of the relevance of the argument is that following the prohibition of dance in Hindu temples, some of these dancers have converted and put their art on the stage: the Indian classical dances are today internationally recognized. These dances bear various names according to the regions of India: Bharatanatyam, Kathak, Kuchipudi, Odissi, Kathakali, Sattriya, Manipuri, Mohiniyattam, Chhau, Yakshagana and Bhagavata Mela. Another reason for temples to keep dancers comes from the first one. A competition with the beauty center and aim to attract the devotees and their donations. This argument remains alive in the 21st century regardless of religion. Even if the religious centers (churches, mosques, temples, pagodas, synagogues) have for primary vocation to serve the interests of the population of a nearby geographical area, a competition between the neighboring religious centers, even distant ones, does exist. 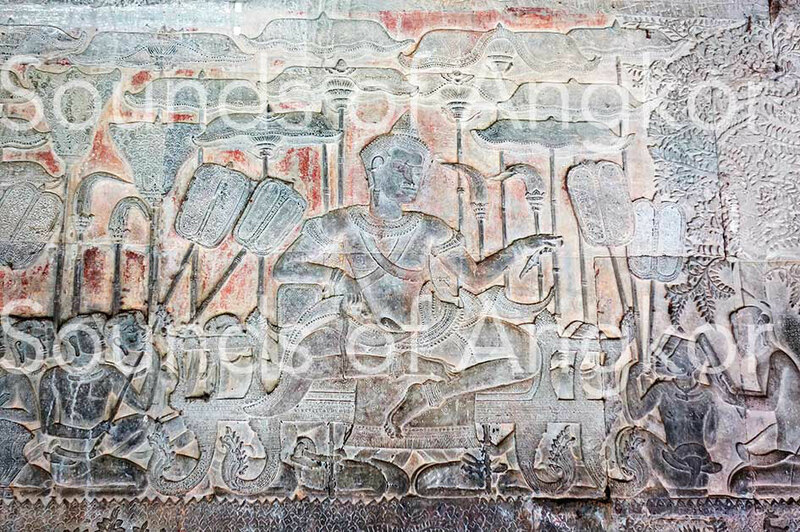 In the Angkorian era, competitiveness among temples was probably less crucial because no transportation and therefore walking distances required additional physical effort to go further. 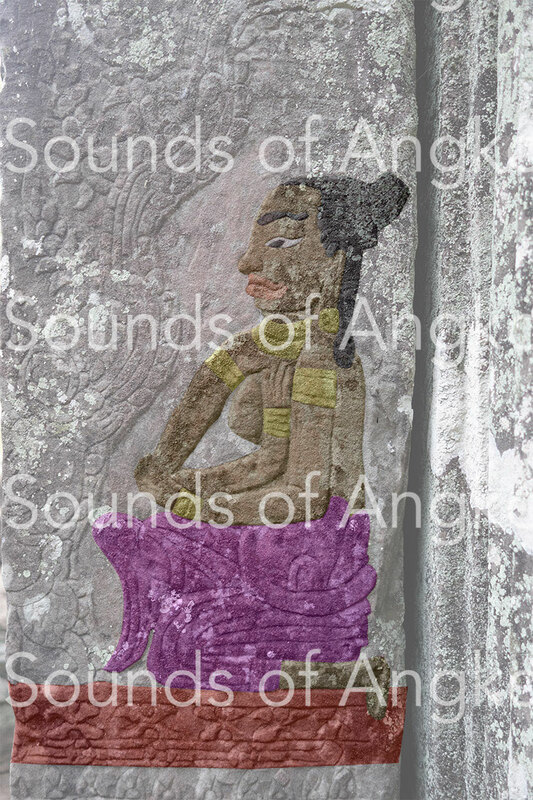 Harp on a Bayon's pilaster played by a woman. A foot is visible. 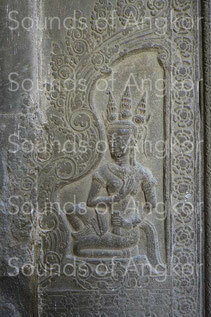 Except for the harp of the Bayon's southeastern forefoot, no other musical instrument is depicted in the dancers' halls. The only epigraphic texts evoking musical instruments in Hindu sanctuaries date from the 9th century in Roluos. They mention zithers, harps, lutes, small cymbals, scrapers and percussion whose nature isn't revealed. However, instruments sculpted outside the dancers’ halls inform us about their nature and their general shape. Instruments of the same kind are apparently used both at the court and inside temples. Rare Bayon and Preah Khan of Angkor's sculptures show us ensembles composed of zither, harp and small cymbals. Other instruments certainly existed but are never represented as for example the scraper, present in the court orchestras and quoted by the epigraphy of Roluos. 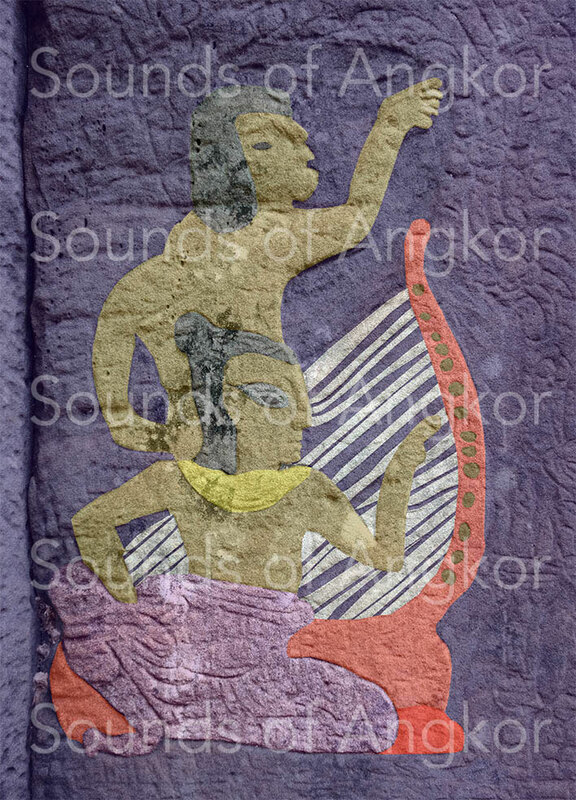 But let's go back to the Bayon harp. It's an arched harp, standard model of the Angkorian era. The number of strings is relatively indefinite. However, despite the mediocre image, the engraver represented the tuning pegs and a foot located at the front of the sound box. Above the harpist, a singer recognizable by her open mouth and finger extended. 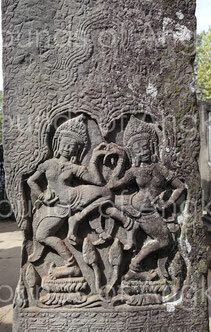 The dancing characters are representations of sacred dancers but not apsaras. Read Apsaras or sacred dancers? In light of this demonstration, a question arises: can the name of dancers’ hall be transformed into ‘dance hall’? The dancers’ halls were certainly places where devotees came to pray and make offerings. They are also located upstream of the sanctuary, which would support the thesis that the common people didn't access central sanctuary. Dance is an offering to deities as well as foods, perfumes, light or flowers. But it has special power because it's a means of communicating with deities like singing and praying. What escapes us today is whether the understanding of this communication was unilateral, that is to say, from the dancer towards the deities, or bilateral, in the sense that the body language of the dancer was interpreted as a manifestation of the divinity. In a word, were the dancers possessed, or did the devotees think that the dancers were an instrument of communication of the divinities? This question is important because one could understand the extreme motivation of devotees to use the dancers as media of knowledge between the deities and themselves. It seems difficult to offer a suitable denomination of these dancers' hall because they were, like most sanctuaries inside these great temples, places of offerings and prayers. If we are in a Buddhist setting, we must not forget that some of these temples (Preah Khan and Ta Prohm) were ancestors’ temples. This involves cults rendered to entities other than the Buddha. Just for dreaming, we can now try to set the scene: statues, altars, offerings of food, flowers, incense, light, female (and male?) musicians, singers, dancers and devotees.